Travis Horanski (Duguald, Man.) of the Langley Blaze, fielding a grounder, had a key triple in the Prairie Purples 3-2 victory over Quebec Blue. Photo: Jonathan Soveta/Toronto Observer. Prairies Purple is are out to make a statement in Toronto. 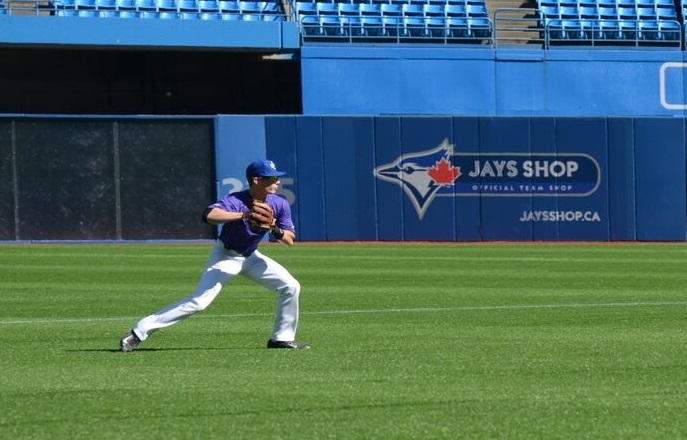 Travis Horanski and Danny Berg hit triples in the final inning as the Purple edged the reigning Tournament 12 champions, Quebec Blue, 3-2 in the first game of day two at Rogers Centre on Sept. 16. After easily dispatching the Atlantic Maroons 8-1 on Tuesday night, the Prairies (2-0-0) found itself in a much tougher contest Wednesday morning with Quebec’s William Sierra on the mound. After a couple of unsuccessful appearances at the plate, Horanski’s seventh inning three-bagger with one out to put the Blues (1-0-1) in a difficult situation and was ultimately the deciding factor when he scored just a couple of batters later. The match was a hotly-contested pitching duel to begin as both teams failed to record a hit until the fourth inning (games are only played to seven innings in the event rather than the standard nine) when a single by Brett Resch of the Prairies broke the hitting deadlock. Quebec Blues countered shortly after as Issac Deveaux belted a hit straight up the gut in the bottom of the fourth. From there, Mathieu Chiz-Majeur and Marc-Antoine Tremblay followed suit, with Tremblay cashing in Deveaux to tie the game 1-1 at the end of four. For Quebec, Sierra went three complete innings, recording three strikeouts and allowing one unearned run although he started off a bit shaky. The right-handed hurler began by walking Liam Giesbrecht, then by throwing consecutive wild pitches to allow Giesbrecht to advance to third. A Brett Esau grounder to third cashed an unearned run, opening up the scoring for the Prairies 1-0. For the Prairies, Brandon Hatley went four complete innings, allowing two hits and striking out four. Horanski recognized the efforts of the team’s starter along with his other mates. With the big win under their belt now, Horanski is hopeful the Prairies can build off the momentum moving forward.